Transport for London said they would be Europe’s longest substantially-segregated cycleways. There will be north-south and east-west routes, with other protected cycle routes being created for dangerous junctions. 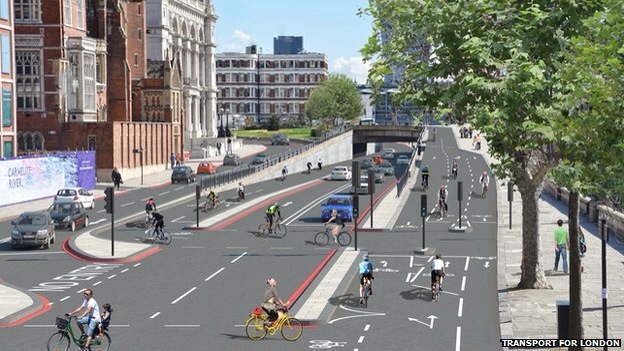 The cycleways are central to the mayor’s £913m investment in improving cycling in the capital. Work will start early next year. But Professor Stephen Glaister, director of the RAC Foundation, said the mayor’s plans would cost £100 per Londoner and challenged him to prove that this was value for money. “It would be a mistake to think London is clogged up with selfish drivers in their cars,” he said. The north-south route will run for more than three miles from King’s Cross to Elephant and Castle. The east-west route will run over 18 miles from Barking to Acton, and include a section on the Westway flyover where one lane will be removed to create a segregated cycle track. 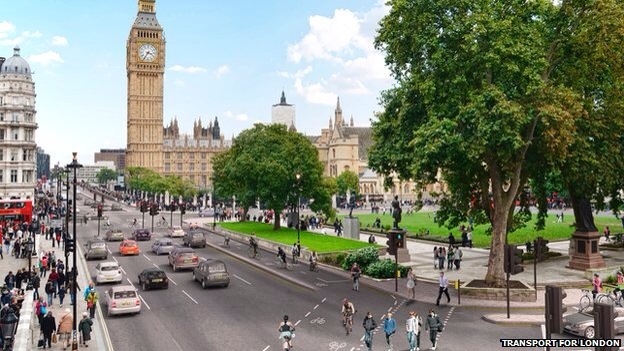 Dangerous junctions will also be re-designed to include protected cycle routes at Tower Hill, Blackfriars, Parliament Square and Lancaster Gate. Routes will be created for other parts of the City, West End and London suburbs. The routes are due to open in March 2016. So far this year, nine cyclists have died on London’s roads. This entry was posted in travel and tagged chrismacgowan, christopher macgowan, cycleways, Mayor, RAC Foundation, Stephen Glaister. Bookmark the permalink.